We need good association. Then affection will grow. Otherwise, the fitness will not come for us to progress in the higher plane. First, a relationship will come through association, and when a relationship is formed affection may come. It is first necessary to have a relationship with Guru and Vaishnava, the devotee of God; otherwise affection cannot be ours. Here, we must know that regard for Guru and Vaishnava is necessary before affection. Then progress will come to us. Adau sraddha tatah sadhu-sango ‘tho bhajana-kriya, tato ‘nartha-nivryttih syat tato nistha. Affection comes to us through nistha, then ruchi. Divine relationship is always closely connected with sadhu-sanga, association with the saint or pure devotee of God, but before that sraddha or faith is necessary. If faith is firm, then we can try to have a relationship with a sadhu, and through the association of the sadhu, learning to serve with devotion and becoming purified of evils, in a higher plane affection may come to us. But it is first necessary to go through three or four stages before affection. Still, it may come to some immediately – affection is within everyone, and it can grow without any cause. Even in this mundane world, we can sometimes see that from the very first day of meeting people are very good friends. As soon as they see each other, affection comes immediately. So that is also possible in spiritual dealings, but before that some sukrti – good fortune – must work in the background. 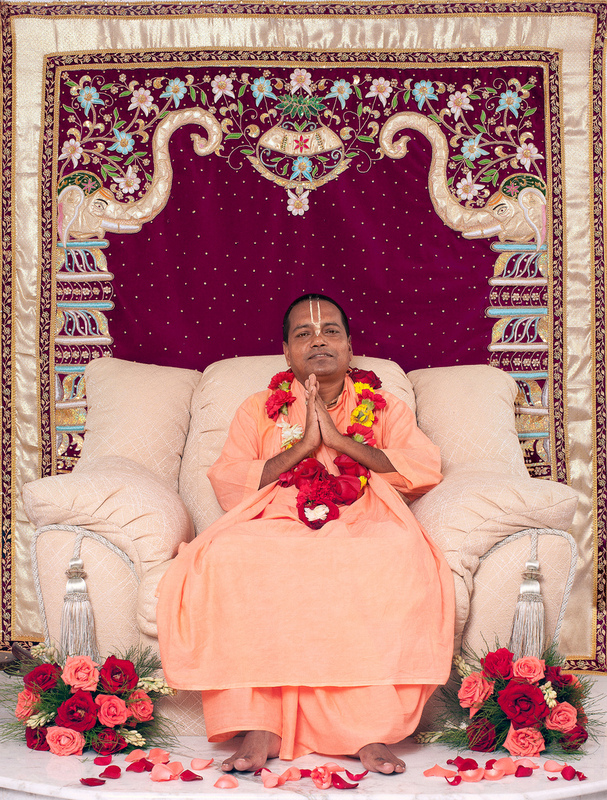 When practising spiritual life, doing what we call sadhana, at that time it is necessary to have the association of the saintly devotees. Through that association regard grows within, and hankering arises. Actually, hankering gives affection, but until we have real hankering for the Divinity it remains suppressed. After purification, firmness will come, and from that ruchi or taste for the Divine will come. And from ruchi affectionate relationship begins. But all these things are attained through association of the saintly devotee. Without that association Divine Serving Activity is not possible; when one is not qualified, the proper serving may not be accomplished. In an unqualified way, one’s mind may wander at random, thinking, “this is perfect, that is perfect.” But because one is living in the environment of illusion, it will not be real service. No doubt, by good fortune it may be sometimes correct, but generally it will not go in the correct line, because the illusory environment will misguide us. Anor aniyan mahato mahiyan. If we say that Brahman, the Spirit, is very great, the idea of greatness means ‘like the sky.’ Beyond the sky, we have no idea of greatness. But such knowledge will not act there! The Transcendental World is completely separate and beyond this knowledge. So, generally we shall go the wrong way. This is why the proper association (sadhu-sanga) is necessary. There are two kinds of sadhu-sanga. When we have no person sadhu to associate with, the holy books will help us. But if we have the association of a good sadhu we can attain the divine goal under his guidance directly. Not everyone will feel affection. Good fortune will work in the background. With strong good fortune, one can immediately cross over the next three stages after association with the sadhu. But this is possible in very special cases only. Our Guru Maharaj used the word “affection”, but it is necessary for us to know the line in which he did so. Affection is possible everywhere, even from the lower level to the higher level. Somebody wants to feed others – that is also a kind of affection. He does not want to eat so much himself, but he would rather feed others, and this gives him pleasure. If anybody eats more at that time, the affection of the distributer immediately goes to that person. Another example is that even before a child is born, affection for the child grows in the mother’s heart. When there is a firm relationship, affection may be established; and relationship will be firm through the sadhu-sanga. Everyone has a relationship with everyone, but feelings are manifest according to the relationship. Even if people may not know that they are relatives, by birthright they have an automatic relationship within. Sometimes our Guru Maharaj would say that “By dharmma-buddhi – a virtuous attitude, sense-control is possible; at that time, a relationship with the higher will also come to us through that virtuous attitude.” Affection for the higher will grow if we keep a virtuous attitude. I know that this medicine is bitter, but my tongue and senses do not want to accept it. But my intelligence will give me more than that. My intelligence can say, “If you take this bitter thing, your health will be better.” Then, affection comes to us for that bitter medicine. In this way we can try to have a proper relationship. In the Mahabharata, we are taught that when we are not sufficiently eager to have a relationship, it can be established by a virtuous attitude. And that virtuous attitude is living with us. We may be living in the mundane world, the illusory environment, but virtuous attitude does not forsake us. Otherwise we would live randomly. We do not live at random. When someone is travelling opposite to my direction, there will be a clash, or a crash, if I don’t leave some room for him. That is virtuous attitude. When affection is not openly expressed, it is necessary to correct our vision. Then it will come. 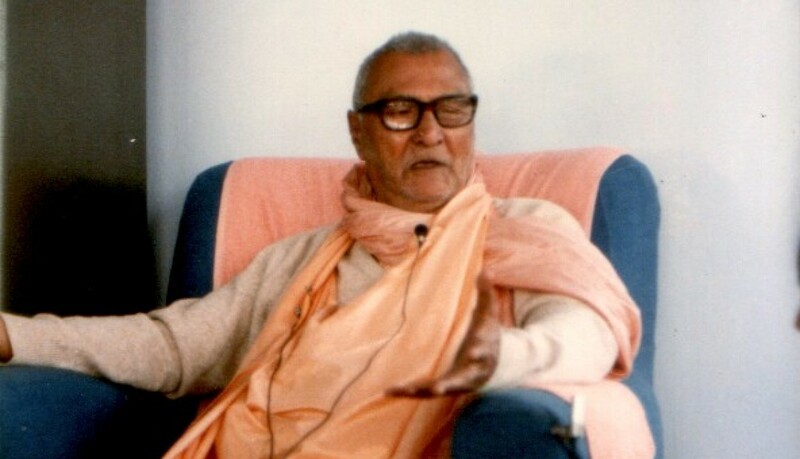 Sometimes during the time of Srila Guru Maharaj, he would insist on some plan of action according to his desire, but we could not understand his logic. And if we objected, he could not understand our idea either. Still, we followed Guru Maharaj’s idea. Virtuous attitude. And when the result came, we would think, “Oh! Guru Maharaj has done so much good for me!” This happened many times. Sadhu-sanga, if we can follow it, will give us relief from so many things. It will give a very good result in the future. But all depends upon sraddha, faith. 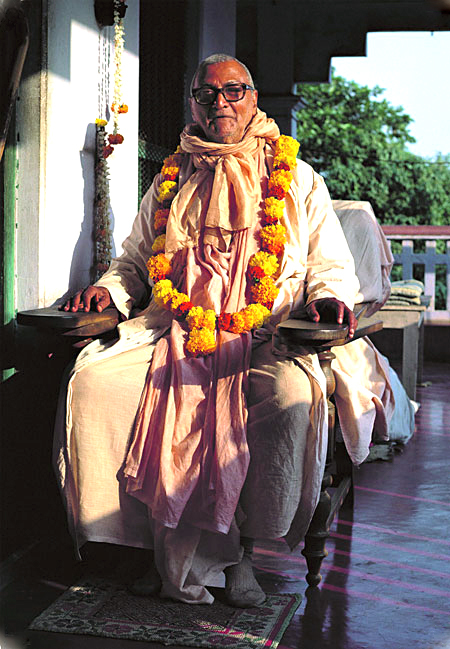 Adau sraddha, tatah sadhu-sanga. First faith, then the saintly association is ours. And the translation of sraddha is more than just ‘faith’. It is actually affectionate faith. Chanting the Holy Name is also like this. We are chanting Hare Krishna. Are we really chanting – or are we just creating a completely material sound vibration? Srila Rupa Goswami has described this very nicely: atah sri krishna-namadi na bhaved grahyam indriyaih. How should we chant? Sevonmukhe hi jihvadau svayam eva sphuraty adah: He will reveal Himself. When He is happy with us, He will feel, “Here is my dancing stage.” If we properly prepare that stage, He will happily come to dance on our tongues. We cannot expect to catch the Holy Name with our mundane tongue. The Holy Name is Transcendental, and we cannot catch it by the use of our mundane senses. This is why Guru Maharaj gave much importance to service life. Seva is service. The attitude of service is necessary. And when we are firm in our service attitude, the stage will be automatically built in our bodies. So many say they are initiated. Have they got real initiation or not? When one is initiated by a genuine Guru, because the Guru is non-different from Krishna, Krishna will take the full charge of the disciple. And when Krishna does that, nothing mundane can remain. Atma-sama means Transcendental. Krishna makes him transcendental. When he surrenders to the Guru, Krishna makes him transcendental. Sei deha kare tara chidanandamaya – his form appears the same, but it is transformed to a transcendental form. We see this devotee seated here, but his form is transcendental. Sei deha means ‘that body’ – takes a transcendental form. Then aprakrita-dehe krishna-charana bhajaya – after that, the disciple does bhajan, Divine Service, and Krishna accepts his service. So where is the justification of all this? If everyone says it is all false, then will no one take initiation? But another part of Sri Chaitanya Charitamrita explains to us that this is a certain stage of development. Premno hi bija-pradam. The Guru takes the responsibility to give the seed of Krishna-prema, Love of God. So we are not to be hopeless! Now if we are given the seed, if we plant it properly, it will gradually become transcendental. This is the inner meaning. So we cannot be hopeless. 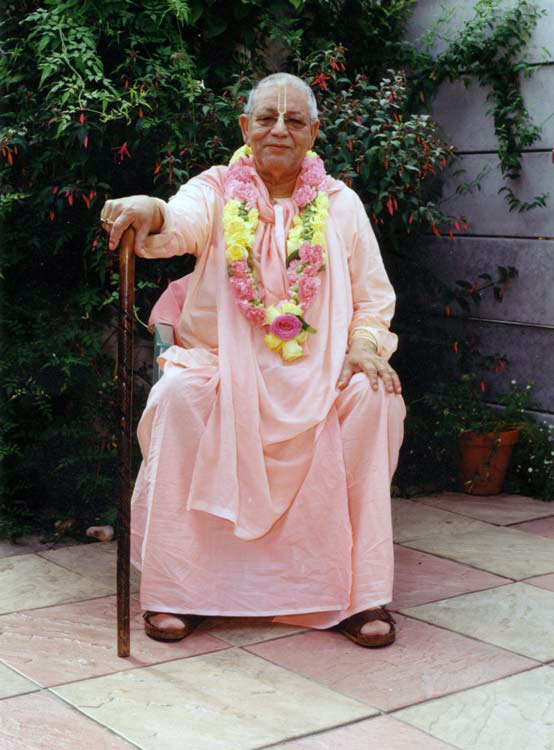 The other day I said that we have got two very great Gurus – one is Srila Swami Maharaj (Srila A.C. Bhaktivedanta Swami Maharaj Prabhupad) and one is Srila Guru Maharaj (Srila Bhakti Raksak Sridhar Dev-Goswami Maharaj). So we have no doubt that we have also got the real seed. The seed is genuine – we see that all over the world people are chanting Hare Krishna. It is a fact – everybody knows now. Even in Russia, there also they know about Sri Chaitanya Mahaprabhu and Nityananda Prabhu. Also in Hungary. And this consciousness was given by Srila Swami Maharaj, and Srila Swami Maharaj considered Srila Guru Maharaj as his Guru. So we have no doubt that we have not only got a great Guru, but we have two great Gurus. They are karna-dhara – they are our Guardians. The Guru is the captain of the ship. If we do not follow the orders of the captain, that is our defect, not his. So we should now try to plant that seed properly. That duty is called bhajana-kriya or proper performance of devotional duties and services. Through that, anartha-nivritti or purification will automatically come. A sense-controlled person is free from mundane attachment. We are fortunate that we have seen many such souls. But all credit is to my Guru. He can make a crow into a Garuda. No credit is mine. If I feel anything is to my credit then I fall to the worst position. And such a sentiment must come from the heart, not just formally. If somebody wants to show ‘I am a Vaishnava, so I must show my humility’ – that is not Vaishnavism. Humility will come from the heart. That is real humility.